Dr Jon Clarke and I headed for another intensive EVA yesterday. We started gearing up at 9:30 in the morning and entered into the EVA airlock at 10:13. We finished our five minutes depressurization and then egressed the airlock to explore the ‘Martian’ land! This time our objective for the EVA was to collect percentage data for hypoliths abundance in that particular site. This visit was actually inspired by our first visit to that site when we found many quartz rocks nicely colonised by our green friends. 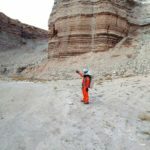 The second objective of our yesterday’s EVA was to scout for lichen colonies and collect some samples for laboratory processing and eventually send both the data and sample back to our Earth-based scientist. This EVA was successful and lasted for 3 hours in the freezing and windy conditions. 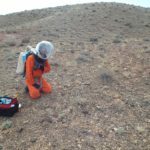 The most memorable moment during this EVA was when Jon and I started climbing the high slope to reach the actual sampling location. Climbing in the heavy space-suit is always physically challenging. So we were halfway and suddenly Jon started telling me “You are (we all are) among the very few people in the world who have done this kind of sustained scientific study in the simulation”. I was wondering why all of sudden he started telling all that… he was actually trying to boost my morale while climbing by reminding me the significance of the work we are doing as part Mars 160 mission. He was trying to make my climbing easier. He said it was not intentional but he was kind enough to make me realize the importance of my own work! Figure 1: Jon on the field. Figure 2: Me indicating the way to the sampling site.